"Smart cuties are wearing bootees in fire-engine red and junior-navy"
This weeks baby bootie is from the early 60's. The suggested colors are era-appropriate bold: fire-engine red and junior-navy. Well, when looking at the original picture (below) these colors are not the first ones that come to mind. Nonetheless, these booties are really, really cute! Because of the mix of different patterns it is a quick knit. There are no 'endless' repeats of boring stocking stitch rows. It took me only a few hours to finish one. I'd say it is an intermediate pattern, especially the cuffs, but a very patient beginner should be able to knit it up too. 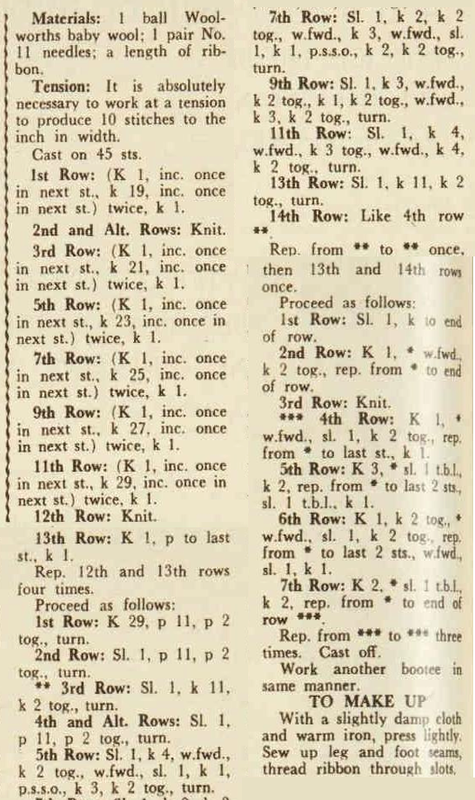 The original pattern instructs to use 10 sts to 1 in (=40 sts to 10 cm). To achieve this you should use a quite thin, lace weight yarn. The suggested needle size is no.10 needles (=metric 3.25) which I find a rather odd combination: too large needles for a thin yarn i.m.o. I made my sample with the usual sport/baby weight yarn and a gauge of 26 sts=10 cm (6,5 sts to 1 inch) with metric size 3 needles. My booties measure 12 cm (=4,7 in) from heel to toe. The width around the ankle before sewing is 13 cm. To make the booties smaller you could downsize your needles. 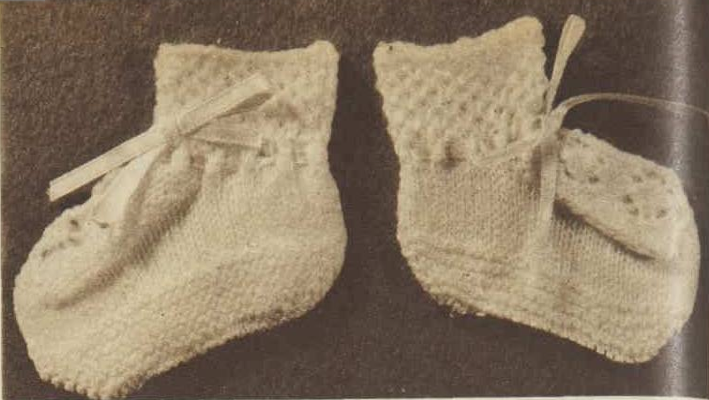 These booties are knitted with two needles, in one piece, from the soles up. The toe shaping is done by increasing from the middle part of the garther stitch sole. The sides are shaped by using my favorite method: decreasing alongside the lace patterned instep. This way there is no need to pick up stitches along the instep! I suggest to count, and recount your stitches after every row of increasing/decreasing to make sure you don't miss any stitches!